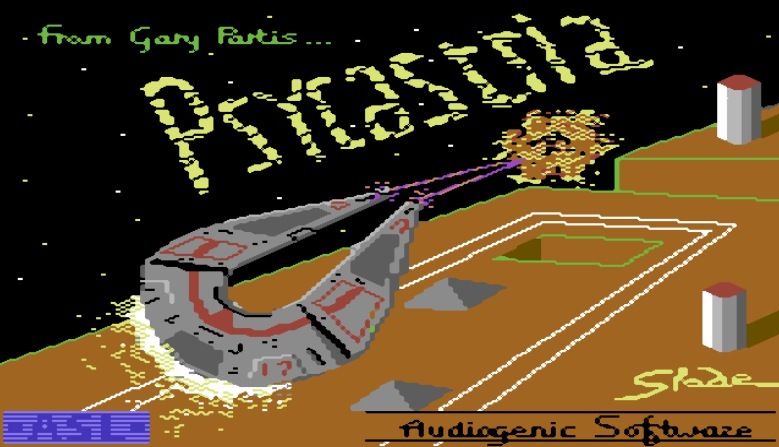 I haven't given much love to the C64 this past week so here's the side scrolling shooter ' Psycastria ' by Gary Partis, and published by Audiogenic Software in 1986 that has been update cracked with some lovely cheats thanks to Pugsy of Onslaught. In this game with its Uridium vibe, you have to blast ground based objects such as docked ships for points while also shooting at or avoiding waves of enemies coming at you at incredibly fast speeds! Be warned Psycastria for the C64 is very difficult to master, so expect a lot of frustration in this game as some of the enemies that attack you can appear at any time, at any speed and from any angle. You also have to be careful to keep an eye on the ground as some ground based objects such as walls will blow you up in one smashing hit. Thankfully the game does give you a chance to swiftly turn your ship around or move out of the way if an enemy gets too close.